Our new item-Especial Flashing Pin. It is very suitable for promotion. 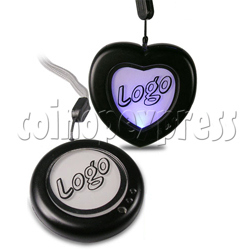 Flash back light necklace with big exchangeable LOGO place. The flash pins or flash magnetic body are made by plastic panel with metal spares etched on back. The lights are supplied by one AAA long lasting battery. Any light color is available.